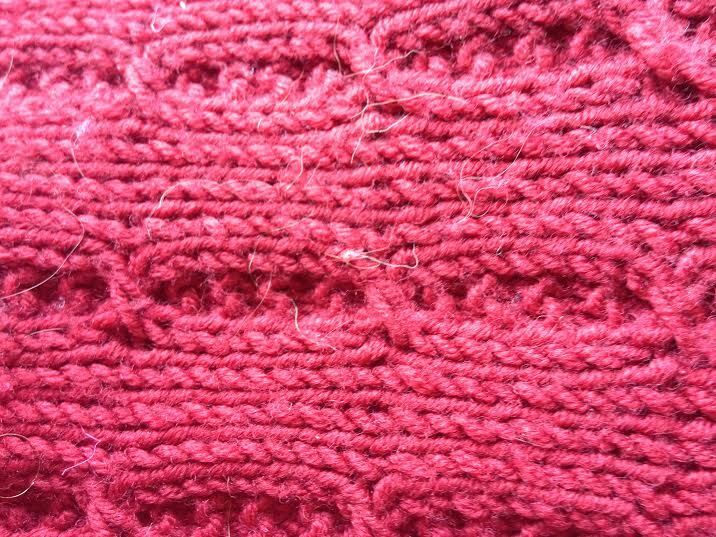 How to become a Professional Knitter - Robin Hunter Designs: Are You Hooked on Super-soft Yarns? Are You Hooked on Super-soft Yarns? "People, we have a problem. Too many of us are still hooked on the super-soft Merinos of the world. So hooked, in fact, that most yarn companies are afraid to offer anything else. It's a self-fulfilling prophecy. If we want any variety in our stashes, we must buck the trend." What do you think? Is the above statement true? For the record I agree. I, like most knitters do love working with soft yarns. They feel wonderful against the skin and are delightful as they move between my fingers while I'm knitting. On the other hand I'm careful about what projects I choose them for. 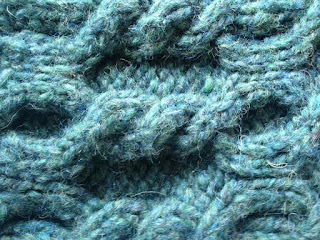 Accessories are good for soft yarns as they don't get the hard wear that garments do. They also don't suffer from abrasion at the edges and under the arms. 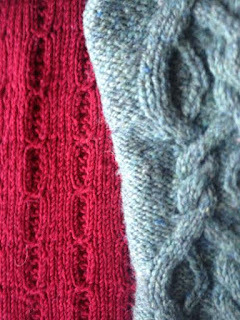 I do knit garments to wear against my skin and will choose soft yarns for those, however I do so knowing their shelf life will be shorter. 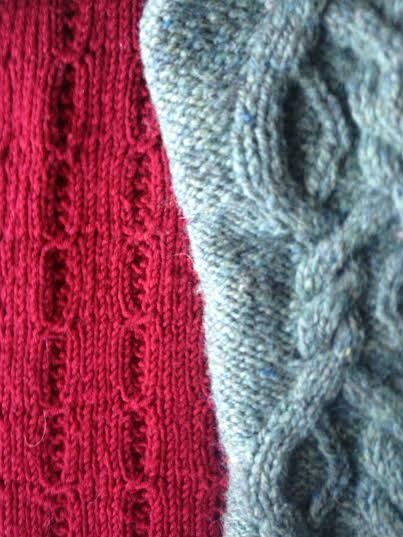 I choose coarser yarns for sweaters that I put a lot of work into. Usually cables and heavily textured fabrics. 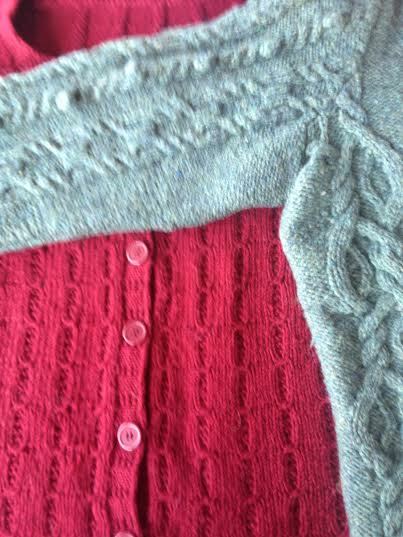 I also plan those garments to be layered over other clothing so my skin isn't in direct contact with the yarn. 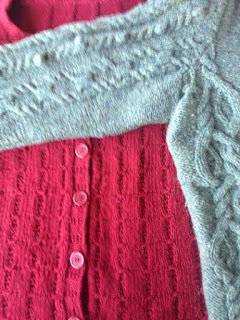 The photos are of two of my sweaters. I think you can see they have about the same amount of wear. I can tell you the red one is much softer. I've pulled pill balls off of it frequently before I put it on. The blue one is a little fuzzier when you look at it, but only at very close range. The cables are crisp and stand away from the background. I haven't had to de-pill it at all. The red one will be three years old in October. The blue one is about 20 (maybe more) years old. 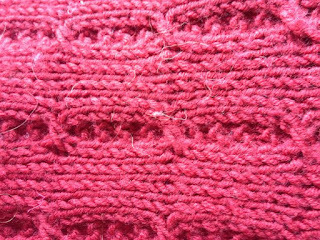 I really hope these sturdy hard wearing yarns don't disappear. I think they have a place in the knitting world.